The long-awaited Leveson Inquiry Report is out, but it looks like it was not worth the wait. Indeed its is an example of a psychological phenomenon which is sweeping the political and corporate world at the moment – distraction. People appear to be focusing their attentional resources on the wrong thing. The Leveson Report, for instance, has 2,000 pages in four volumes, summarised in a 49-page “Executive Summary” of which only one single sentence mentions blogging and social media. And that sentence on page 6 is merely pointing out the obvious, that newspapers face competition from online media. I am not sure we needed an inquiry to tell us that. The latest study of news consumption shows a massive growth in online news with a further dramatic fall in newspaper usage. Newspaper owners cannot ignore that trend. Though print is unlikely to die completely, if the trend continues print newspapers will become a minor part of the activity of news organisations, rather than the main focus. Indeed, many people might argue that this is already the case with The Times having its paid-for online versions and The Daily Mail website bringing it 30% more readers per day than individuals who see its print version. Meanwhile in the Westminster bubble politicians are debating what can be done about the ethics of print journalists and how they can get them into line without heavy handed legislation which would hamper a free press. Well first I’d suggest they read McNae’s Essential Law For Journalists which will show them that the current laws covering news gathering and reporting are significant. The press in the UK is already tightly controlled. We have libel laws which are the most stringent in the developed world, for instance, and the law governing inquiries and tribunals, such as the Leveson Inquiry, means that such “public” inquiries can actually be held “in camera” meaning the press are not admitted and cannot report on them. And according to McNae there are 800,000 Inquires in the UK each year…! Remember too that the whole “phone hacking” scandal came about because the police failed to investigate what is an illegal act. The newspapers and journalists that did this were not just acting unethically, they were acting illegally. There was no need for an inquiry into this issue – people should have been prosecuted. Indeed, several cases are already being prepared and charges have already been made – albeit, some would argue, several years too late. So Lord Justice Leveson spent months hearing evidence and no-doubt burned the midnight oil to produce his massive report, all focused on the regulation of the print media. Meanwhile, bloggers, Twitter users and those who write on publications which are solely produced online can carry on regardless it seems. So if you were a savvy media owner who wants to behave unethically and without fear of regulation the solution is easy. You simply focus your activities online – where most of your audience is going to be anyway – and your printed version is produced by a company established in a foreign country outside the jurisdiction of the UK regulatory scheme. True you would still have to abide by the laws governing publication, but hey-ho you could get away with all sorts…! The political debate will drag on for several more months yet, the print media owners will fall into line with the Leveson proposals and meanwhile the rest of us will continue to ignore print pubilcations in favour of online news, where untrained writers can produce all sorts of nonsense without knowledge or training in media law and where unethical and immoral writing happens already on a daily basis. In a couple of years’ time the politicians will no-doubt demand an Inquiry into online writing to try and get it regulated. 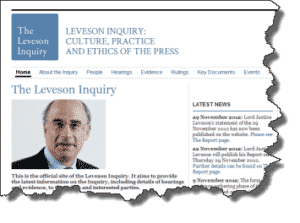 The Leveson Inquiry is a wasted opportunity because it could have dealt with that issue now, but didn’t. Politicians still seem to believe in the power of the press; they don’t seem to have noticed the Internet. They are much like many business owners who focus on old-fashioned, real-world ways of gaining business without seeming to realise that the majority of purchasing decisions already start online. Too many people are paying attention to the wrong things it seems. No doubt Leveson will change the ethical approach of many newspapers and we’ll all think that the regulation is a good idea when it finally arrives. But meanwhile the bulk of us will face unethical reporting and immoral writing in the place where most of us get our news these days, the Internet. Missing that out in the Leveson Inquiry was a major flaw. Just like missing out prosecuting illegal acts of so-called journalists was a major flaw by the police. Thanks for your comment Dominic – much appreciated. I like your point that the politicians worry a lot about popularity. If you consider the enquiry in terms of declining print press news circulation, the effectiveness point may be true. However, the major titles (except the Times) have far reaching websites as well, though the the overall effect is dilution from other news sources. If you consider the point from the perspective of the people damaged by journalistic activities used by the Murdoch press, that is what people are reacting to. The power and fear the NOTW and Sun journalists had over their victims, and the threats they could make against the police rendered their activities unstoppable no matter what laws were made, read Murdoch Inc for this. To this genre of journalists, McNae was irrelevant. The PCC was absent the scene, and the only recourse against the press for the ordinary mortal was and is, unbelievably expensive and risky legal action until regulation that gives the picked-upon a level playing field to challenge them. So I have written to my MP to request full implementation and statutory backup. It’s about giving the unfairly picked upon a voice. Thanks for your comment – I agree that the people damaged by the activities of some of the mainstream press had almost now way of dealing with the issues raised. But my point really is that following the Leveson Report they will still have now way of dealing with things. The recommendations for a legally backed self-regulatory body means that anything outside the remit of that body – blogs/online media – can carry on doing all those dreadful things. All that Leveson does is make people THINK the issue has been dealt with by setting up some kind of legal framework. True, it will certainly contribute to an improved situation for the impact of the mainstream printed press – but they are much less significant than they like to think or that politicians realise. Even people in the media don’t appear to know the world has changed: every night on TV and radio there is a “newspaper review” – yet more than half of the listeners or viewers never even look at a newspaper. It is a rather pointless exercise with the media glitterati and the political elite chatting about the newspapers as though they were important. Leveson only deals with this “old world”. And what that means is that even though people will get a better deal from the press if there is full implementation of Leveson’s recommendation they will still face unethical, immoral and illegal behaviour in the place where most people get their news – online.